Appeared in the Wisconsin State Journal 'Homes' section, Madison, Wisconsin, Arpil 5, 2009. EMA trailers will live in infamy. Less notorious, but perhaps just as faulty, is much of the housing on Indian reservations in northern Wisconsin. Houses nicknamed the "chicken coops," built in the 1970s by the federal Department of Housing and Urban Development (HUD), overheat in summer and freeze in winter. Split-level "matchbook houses" get moldy and have particle board siding that disintegrates. Much of the pre-fabricated housing, including trailers, went up from the 1950s through the 1970s and is seriously outdated. "There are whole subdivisions like that, and there are long waiting lists for 'chicken coops' on some reservations," said architect Lou Host-Jablonski of Madison's Design Coalition, who has made it his mission to bring affordable, green, multi-generational housing to the reservations. And, just as importantly, he wants to teach tribal members how to build the houses themselves in order to create vocations. Host-Jablonski was recruited for the project by Sue Thering, an assistant professor in the UW-Madison Department of Landscape Architecture who has worked in blighted communities in coal country and elsewhere, and was asked for assistanceby tribal housing officials. "Rural poverty on and off the reservation is something to be embarrassed about," she said. "The perception that all the tribes are rolling in casino money is terribly unfortunate." 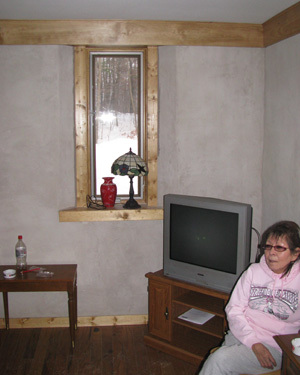 This winter, the first house was finished, and Betty Johnson, a Chippewa on the St. Croix reservation, left her dilapidated trailer and moved into a four-bedroom, 1,400-square-foot house. As soon as her adult children saw the design for her new home they decided to move back to the reservation. "A lot of people want to come back to the rez, but they couldn't because there wasn't any housing." Host-Jablonski said. Also in the works are plans for 3,600-square-foot "Green-Generation Houses" with living space for at least a dozen family members, as well as space for a dining table to seat 20 or more in a round room reminiscent of a wigwam. Other reflections of Indian culture are seen in the placement of doors: Entrances face east as wigwam entrances did for thousands of years, while doors opening to the west were used after wakes, since corpses were traditionally carried west. During planning, the team realized that residences that might seem crowded to most Americans would not necessarily seem that way to tribal members who often prefer to live with extended family. "Grandparents, aunts and uncles can watch the children and share the chores," Host-Jablonski said. "It's much easier onfinances and the environment. Instead of three separate buildings with exteriors and separate systems, there's just one." The houses are insulated with straw and clay, an ancient method updated by Host-Jablonski, who helped devise a system of coating straw with a slurry of clay that looks "like a milkshake"; the clay protects the straw from rot by wicking moisture to exterior walls, where it evaporates. The straw-clay mixing equipment Host -Jablonski developed with colleagues can be inexpensively made from easily available materials and, ideally, shared between tribes. He also envisions manufacturing the mixers by modifying ordinary farm equipment, which could lead to "mom-and-pop operations." 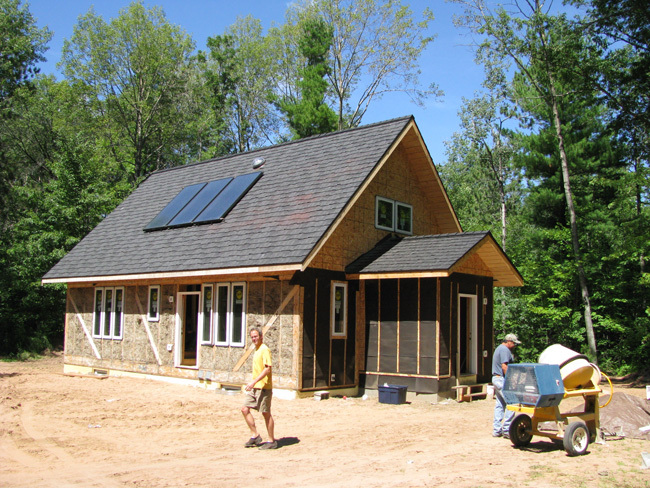 Host-Jablonski's own home received a city of Madison building permit for straw-clay insulation, and his work has been supported by HUD. "We would never bring anything experimental to low-income families," Thering said. Recycled, energy-efficient and nontoxic materials (no formaldehyde, vinyl or volatile organic compounds) are also used in the houses. A combination of funding sources, including money from the federal stimu lus package, will pay for the "high-performance natural homes." Thering expects the role of her team in reservation housing will end in about six years. "We want to work ourselves out of a job," she said. "We want to teach people to do this work really well, and we want it to be a model for the rest of thecountry."